​Karina Palokangas is a Certified Massage Therapist, offering relaxation massage and deep tissue work. Karina has been working as a massage therapist since 1998. Massage is a healing art. The relaxation massage she does uses long, flowing strokes with a pressure that is comfortable to the client evoking that “melting” feeling. Deep tissue work focuses on a small group of muscles or problem areas working at the client’s comfort level through the layers of muscle and fascia to alleviate the tightness causing discomfort. Everyone can benefit from bodywork. Whether a person is stressed out due to the demands of life or just has areas of tension and soreness or whether a person is young or old, the power of touch to initiate healing can help anyone. Listening to her client’s needs is paramount. 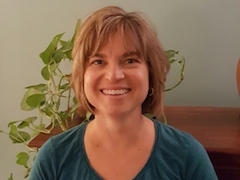 Karina strives to make clients feel comfortable by providing an experience that will hopefully encourage people to continue receiving massage therapy and other forms of bodywork. Karina has a Bachelor’s degree from the University of Minnesota-Duluth in adult fitness. She is always happy to answer questions regarding health and fitness as she believes one of the keys to good health is the way we treat our bodies. Karina loves being physically active and enjoys many activities such as golf, hiking, swimming and water sports, travelling, and cooking. Take the time to feel better!